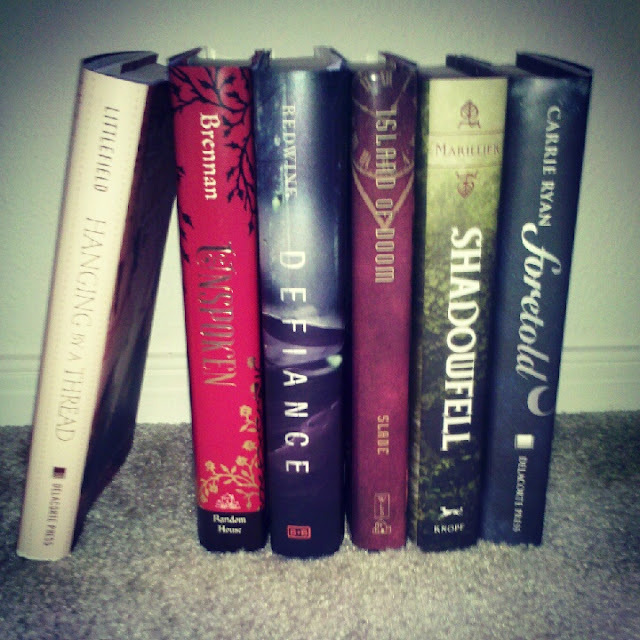 I'm the lone wolf on the blog today with a book haul. But it was pretty excellent! So pumped for Dearly, Beloved. Enjoy! Great haul. I know what you mean about having to be careful. Jealous of all these, but REALLY jealous of your hard copy of Dearly,Beloved. It is SO SO SO good! So many beautiful hardcovers! Skinny looks awesome ... and Dearly, Beloved is one I hope to read at some point, but I've heard mixed reviews. I totally understand about not buying books when you don't have a job! I've overbought plenty in the last months and am trying to smarten up. I'm with you about the Unspoken cover. It is beautiful! Ive heard a lot of people like it too! :) enjoy all your fun new reads! Awesome haul! I have been swing Skinny all over the blogosphere and that really makes me want a copy! Defiance and Unspoken look really good also! Happy reading! Defiance and Shadowfell are really high on my to-read list. And I LOVED Dearly Beloved! Pretties! I still need to read Dearly, Departed. Great haul! I have Shadowfell on order. I rodered it so long ago, I can't quite remember what it is about, but she is a good author. I'll be looking forward to your review. I can't wait to read Defiance, I should get it around next week. I also really want to read Foretold. Will wait for you reviews of these books. Really cannot wait to read Skinny! Looks really good! Shadowfell is fabulous. Also so is Defiance!